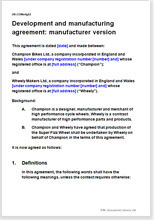 Most agreements like this are for the customer to initiate and control. This one is for the manufacturer to set down the terms he wants. It covers the structure of a complicated deal in simple terms you can edit yourself. The deal is that you agree to make up prototypes and complete any necessary design work, get it approved by your customer and regulatory authorities, then make it up to your customer’s order to the agreed standards. It protects you very fully and makes sure you get paid. We cannot hope to think up the specification for every possible product. We leave it to you to provide your specification for design work, finished product and standards to be achieved along the way. We assume you will do this in conjunction with your customer so as to create a full specification which can be attached to the agreement. Favours the manufacturer, not the designer/customer, so puts you in the driving seat. Suitable for a contract with foreign customer. Setup costs and payment for product development - who pays?